Jason Brand’s latest assignment took him into the San Juan Mountains of New Mexico. He was looking for a Deputy US Marshal and a government geologist, both of whom had gone missing. But what should have been a routine assignment turned out to be anything but—with an unexpected surprise for him along the way. Bodie the Stalker, on a hunt for a brutal killer, rode the same trail. For him it was just another manhunt … until he found himself on the wrong end of the chase. Then there was the Monk clan … They were a family that had no time for visitors because they had secrets to hide and were more than prepared to kill in order to keep them. But then Bodie met Brand. And when they joined forces, the Monks found themselves fighting for their lives. Brand and Bodie—when they teamed up it was like hell had come to the high country. So who are Bodie and Brand? Bodie is a bounty hunter known as The Stalker. He appeared in a six book series published in the UK back 1979. Brand’s publishing history is a little more complicated. This series was originally written for Norwegian publisher Bladkompaniet (who put out the Morgan Kane series). Later some of these books appeared in English, published by Linford Western Library and it was rumoured there was a planned book that would see Neil Hunter’s two heroes team up, something fans of these series really wanted to see happen. Sadly it didn’t until now, some 35 years later! Piccadilly Publishing have recently put out all six Bodie novels as ebooks and have done the same with the nine Brand stories. And now they are pleased to publish as an ebook that long hoped for team-up tale, Two Guns North. The book offers everything one could have hoped for. A superbly told tale that really is action packed as the Monk clan seem to have a never ending extended family ready to try their luck against Bodie and Brand. 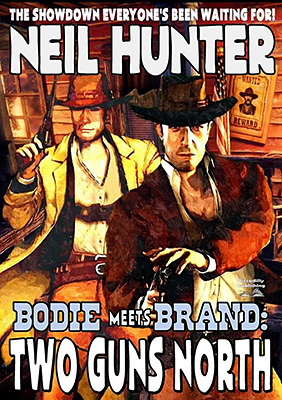 Neil Hunter tells the story more from Brand’s point-of-view than that of Bodie. This was probably necessary due to the unforeseen surprise that’s waiting for Brand early on in this tale, a shock that could be life-changing for him that makes this a must read for followers of the Brand series. It takes a little while for Bodie to appear but when he does the blood and bullets fly. In fact virtually every time Bodie is featured you are guaranteed gunplay – and lots of it. As I don’t want to spoil this excellent story for anyone all I’ll say is that if you’ve yet to read a Bodie or Brand tale then this is a great place to start and I’m sure once read you’ll be snapping up the earlier titles. And for those who are already fans of both series there is great news as the end of the book advertises the fact the Mike Linaker (the author behind the pseudonyms of Neil Hunter) will be writing new books, with Bodie #7: Desert Run due for publication on December 1st. Brand #10: The Killing Days and Bodie #8: The High Riders to follow and hopefully there will be many more too. Buffalo hunter O’Brien has made an effort to settle down to a more civilized life in Fort Revenge, in Indian Territory, helping his friend run a stage line there. However, it isn’t long before trouble comes at O’Brien from two directions: first in the form of an outlaw gang from Tulsa who want to buy his friend’s stagecoach company and won’t take no for an answer, and second from a family of killers who are seeking revenge for the death of their kin at his hands. O’Brien must respond to these challenges with his own brand of gunsmoke, while he wrestles with two life decisions: whether or not to return to the trail, and whether to take Sarah Carter, the girl he brought to Fort Revenge, with him when he leaves. Ralph Hayes first wrote about O’Brien back in the early 1970s, bringing him back in 1992. 2011 saw the publication of a Black Horse Western in which O’Brien returned once more, and this is the third BHW to feature him. The books do mention events from those very first O’Brien westerns, in fact the family gunning for him in this one tangled with him in the 1973 book The Secret of Sulphur Creek (later republished under the title Gunslammer). Hayes gives just enough backstory to understand why they want revenge but not enough to spoil that pervious book should you read it after this one. O’Brien seems to take all the life and death situations in his stride, in fact provokes some of the gunplay himself and lets rage rule his actions when Sarah’s wellbeing is threatened. It’s Sarah who also provides the biggest battle for O’Brien as he struggles to understand his feelings for her and whether they can possibly compete with the lure of the wild. Ralph Hayes does tie-up a number of loose threads that have been hanging throughout this series which makes me wonder if this will finally be the last we’ve seen of O’Brien. I certainly hope not as he makes for a great western hero. For fans of the O’Brien books this is a must read. 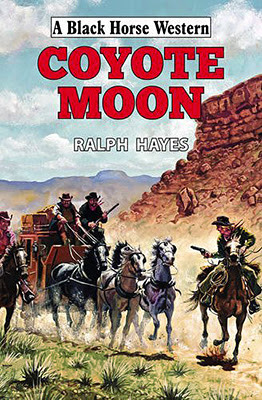 As a stand-alone novel it proves to be a very entertaining and action packed story that should satisfy most western readers and I’d be surprised if it doesn’t make you want to check out more of Ralph Hayes work. Convinced that Blackjack Chancer is behind the death of his youngest brother, Lukus Rheingold steals the Saturday night takings from the gambler’s Wasteland Eldorado. 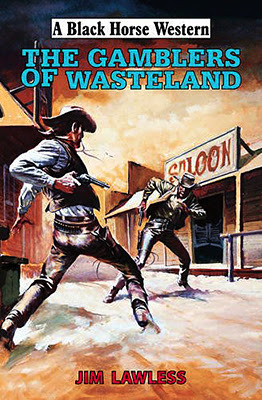 Led by Marshal Jed Crane, the Wasteland posse is outwitted by Lukus’s surviving brother, Kris. The Rheingold brothers head for their home at Nathan’s Ford, where they are followed by a mysterious woman calling herself Lil Lavender, and later by Chancer and his hired gun, Fallon. All three have their own reasons for hunting Lukus Rheingold, and the hunt leads to a final bloody climax in the Rheingold family cemetery. Jim Lawless is one of a fistful of pseudonyms used by John Paxton Sheriff and if anyone has read any of his previous books you’ll know the story won’t be as straight-forward as the blurb above might indicate, for the author always includes many plot twists and turns, many of which will take the reader completely by surprise. It’s these elements that makes Sheriff’s work such a joy to read. Even as it becomes obvious Lil Lavender isn’t being exactly truthful we learn that Lukus Rheingold has a past that may become his downfall. In fact the lawmen he encounters seem more interested in arresting him than finding who has kidnapped his brother Kris. Filled with plenty of action this story gallops towards its deadly finale, one that throws up yet more questions that have to be answered before Sheriff brings his tale to a close. Even then there is another surprise in waiting, and there is also a hint that we haven’t heard the last of some of the characters, that there could well be a sequel further down the line. I certainly hope so. Hale must be complimented on their excellent cover choice.